Bridget “Elizabeth” & Anna of the Valley, Achill Island, County Mayo. Bridget Gallagher was born on November 25, 1874 in Tonatanvalley (The Valley), Achill Island, County Mayo, Ireland. Her sister, Anna, was born two years later on December 12, 1876. The girls were known as “Bridgie Rhua” and “Anna-Rhua” for their red hair. The sisters were born to Anthony Gallagher of Clare Island and Anne McManamon of Achill Island. They were baptized at Dookinella Roman Catholic Church, the same church where their parents had married in February 1874. Bridget’s baptism sponsors were Patrick and Judy Grealis, and Anna’s sponsors were Martin and Honor McManimon. Bridget and Anna were only four and two years old respectively when their father passed away in 1879. Two years later, their mother married James Dugan at Dookinella Church. In 1883, the family emigrated from Blacksod Bay, just north of Achill, aboard the S/S Scandinavian as part of the Tuke Emigration scheme. They arrived at Grosse Ile, Quebec, Canada on May 3, 1883. After crossing into the United States at Detroit, Michigan, the family made its way to Cleveland where other Achill friends and relatives already lived. The Dugan family eventually settled in the Angle, an Irish neighborhood on Cleveland’s west side. On December 13, 1892, 18-year-old Bridget married Cleveland-born Thomas Sammon at St. Malachi’s Church. The witnesses were James Hugh and Julia McManamon. Thomas Sammon worked as a machinist at Midland Steel in Cleveland. In America, Bridget went by the name Elizabeth or “Liz” for short. Her name was listed as Lizzie Gallagher on the civil marriage record, but she was listed by her baptismal name, Bridget, on the church record. Upon her marriage, Bridget moved into the home of her in-laws, Martin and Maria (Fox) Sammon, who were both immigrants from Newport, County Mayo. The home was located on Root Street (now West 47th Street) in St. Patrick’s parish. Thomas and Bridget Sammon had four children: Marie Violet Sammon-Sullivan (b. 1894), Thomas Gabriel Sammon (b. 1897), Ann Geraldine Sammon-Kirby (b. 1901), and Ursula Germaine Sammon-Kelley (b. 1909). Bridget’s sister, Anna Gallagher began working in the restaurant business in Cleveland in the late 1890s and later moved to Atlantic City, New Jersey, where she lived for more than 50 years. She married a stage actor named Major Laird in 1904 and was widowed 10 years later. Anna was the head-waitress at Heilig’s Restaurant on the famous Atlantic City Boardwalk for many years. She met many dignitaries and celebrities while working at Heilig’s. She also traveled frequently and owned property back in Cleveland. During most of her time in Atlantic City, Anna lived at the Wellington Apartments, right across the street from Absecon Lighthouse, the tallest lighthouse in New Jersey. In her later years, she returned to Cleveland and lived with the family of her niece, Ursula Sammon-Kelley. Bridget Gallagher-Sammon passed away on June 16, 1943 at the age of 68. Her sister Anna Gallagher-Laird died on April 19, 1961 at age 84. The Gallagher sisters were laid to rest in the same family plot at Cleveland’s Calvary Cemetery along with Bridget’s husband Tom, two of their children and a son-in-law. In addition to Bridget Gallagher-Sammon’s four children, her descendants include 22 grandchildren, 76 great grandchildren, and more than 150 great great grandchildren, so far. Article and photograph kindly sent in by descendant Terry Gallagher, Cleveland. Wonderful account. I like how you gave such contextual detail and perspective to their story. I think we must be relations. My great grandfather James and his siblings were all McManamans from the Valley (1883.coming to Cleveland and also Nebraska). I suspect Martin was a brother. Their father, also James, may have had a first wife who was a Gallagher too. Well done and thanks for the nice piece. Kevin, This is Margaret Lynch in Cleveland. We have corresponded before. Terry Gallagher is my second cousin. After speaking with your relation Helen Skidmore, I think our McManamons may be more closely related to the Patrick McManamon who married the Grace McManamon in your line. Both families left from The Valley. Wonderful account! From what I have found, we are probably related through Anne McManamon (through her sister Honora) who came with her family a month later (1883 through Boston then to Cleveland). So nice to see this! Thank you so much. Do you live in Cleveland? There were two contemporary Honora McManamons who both married Haneys. The one who was Annie McManamon Dugan’s sister married James Haney. James Haney died not long after they arrived in Cleveland and she remarried an Anthony McCafferty in 1891. Are you descended from her daughter Cecelia McQuillan? Yes I am descended from her daughter Cecelia. No I don’t live in the Cleveland area anymore. Currently living in Florida. 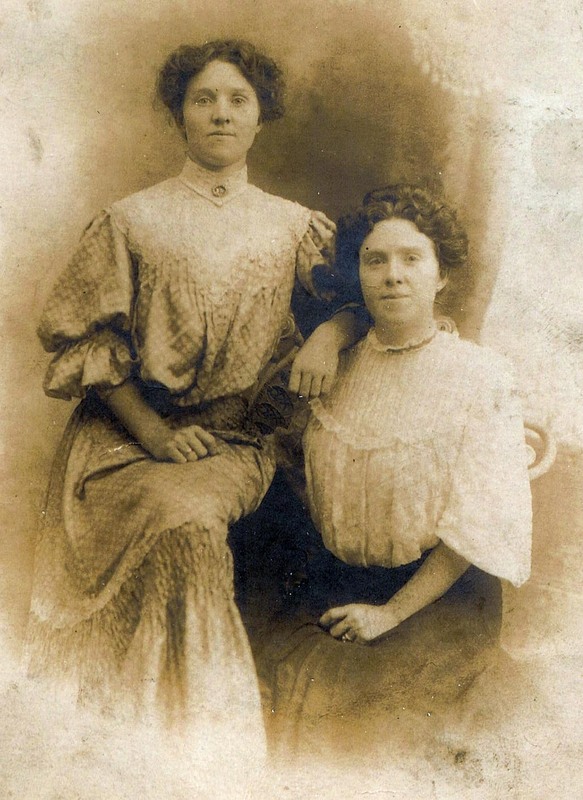 Wow–there are several families connected with Honora’s sister Annie McManamon Dugan who are still in Cleveland. Let me know if you’d like to get in touch. Michelle, you can contact me through my “work” email, which is iaasadmin@gmail.com. I am the director of the Irish American Archives Society in Cleveland. Hi Michelle. Thank you for the comment. It sounds like there are a lot of McManamon relatives who made the journey from Achill to Cleveland. Terry, fantastic article! Wonderful details, amazing photo of the two sisters together. Lovely to read it here in Kilkenny, Ireland, from one of their descendants who lives in Ireland because one of Bridgie Rhua’s grandsons came home in 1948! Terry, what a fascinating article, thank you. It’s wonderful to see that picture, a first for me! I wonder what they would make of me reading it here in Ireland where I was born, as my father, one of Bridget’s grandsons, returned home to Ireland in 1948, from Cleveland. Greetings to all descendants of Bridget, and also all Achill people in Ohio. Hi Breedge. Thank you for your comment. Yes, please feel free to include the story on your Historic Achill Facebook page. Best of luck to you, your son and your cousin!